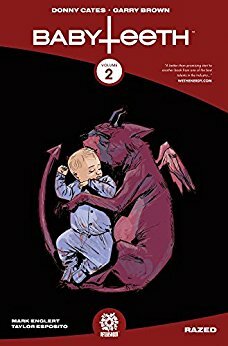 Babyteeth Vol 2 begins with a nice summary of Vol 1. While that is nice for readers beginning here, it spoils the surprises in Vol 1 so I would recommend reading them in order. Also, if you want to read Vol 1 first, please don’t read the rest of this review since it contains SPOILERS for that volume. I loved Vol 1 of this series. As I stated in my 5 star review of Vol 1, I couldn’t wait for volume 2 and grabbed it off NetGalley as soon as it appeared. This story begins immediately after the first with Heather, Sadie and baby Clark travelling on a commercial airplane flown by the girls’ dad. The group is accompanied by the wizard Dancy and headed for the Maine castle built for Clark by the dark cultish group, the Way. In the meantime, the quasi-governmental group, the Silhouette, is trying once again to kill them. Both groups believe that Clark is the antichrist, born to usher in the end times. For the Way that is good news but for the Silhouette it is not. Are both groups insane? Well, little Clark does only drink blood and when he cries people bleed and sometimes disappear. While still a good horror story, this volume doesn’t have the big ‘Clark is who?’ surprise element of Vol 1. There are a few smaller twists in the plot to keep it interesting. An adorable “fire-breathing murder raccoon” and Sadie’s backstory are intriguing. The relative of a past adversary also appears. Babyteeth Vol 2 collects issues #6-10. Single issues continue to be published so I can’t wait for Vol 3. 4 stars! Thanks to the publisher, Aftershock Comics, and NetGalley for an advanced copy.